After the contract with Reebok was finished, Puma was presented as the new supplier of the Sporting Lisbon equipment. Puma had been the very first brand maker of Sporting shirts, in the early 1980s, and now continued into the 2010 decade. Puma innovated a great deal, which led to jerseys that were very well received by some supporters and less well so by other. In any case, after the Centennial year shirts it would always have been difficult to please the fans. In any case, Puma started off quite badly, not due to the white hole on the back, which was probably externally imposed, but due to crest of the Club: for the first and single time, the symbol on the Sporting Clube de Portugal home shirt was die-pressed and not embroidered. Printed symbols were usual already before, in some child shirts, but never in the main football adult shirt. In this season, it was die-pressed in all the shirts, including the Stromp, away, and goal-keeper jerseys. Furthermore, the hoops in the sleeves did not folow the normal pattern, instead, they were a sort of continuation of the hoops of the shirt, horizontally in the replicas and diagonally in the match worn shirts. In the long sleeve version, the hoops did not fill the entire sleeves, that were made long by adding some thin gren fabric. The away shirt was bright yellow, and the Stromp shirt followed the normal classic Sporting tradition. As a very positive point that must be stressed, Sporting started to make available shirts without the sponsor publicity. This was valid for both the home and away kits. Before, this happened only with the Stromp shirt, besides the limited edition of the hooped shirt in the previous season. 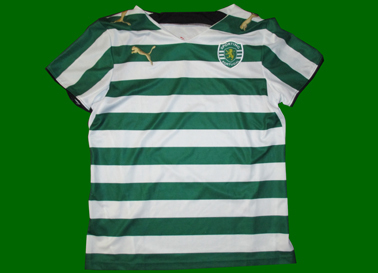 Click here to see all the Sporting Lisbon shirts from 2005 2006. 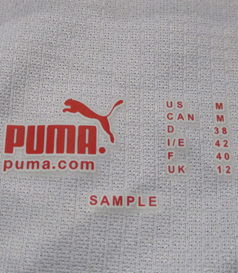 Puma sample, with many differences with respect to the final version that made it to the stores. It does not have collar, the hoops are wider and thus fewer, and the Club's crest is embroidered. Third shirt worn by Marco Caneira in the 100 year aniversary Centennial game. Yes, it is longsleeved even if the game was in August!